Marge Ballif Simon freelances as a writer-poet-illustrator for genre and mainstream publications such as Nebula Awards 32, Strange Horizons, Flashquake, Flash Me Magazine, Dreams & Nightmares, The Pedestal Magazine, and Vestal Review. Marge Simon is a former president of the Science Fiction Poetry Association. She now serves as editor of its bimonthly journal Star*Line, and edits the column “Blood and Spades: Poets of the Dark Side” for the monthly newsletter of the Horror Writers Association Marge has received the Bram Stoker Award and the Rhysling Award for her poetry, and the James Award for her art. 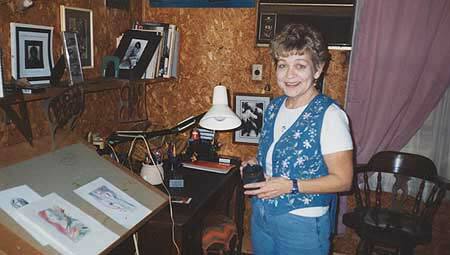 She has also illustrated five Bram Stoker Award collections. In addition to her solo work, Marge Simon has written and published collaboratively with many other authors, including Bruce Boston, Charlee Jacob, Mary Turzillo, and Malcolm Deeley. You can find all Gothic.net articles and fiction relating to Marge Simon at tag Marge Simon.